Pricing - do they offer quality service yet affordable pricing. With this stated, you should rarely, if ever, consider selecting any service provider, especially a tree service, that is the lowest priced. Quality tree service costs money to provide, and if their price is too low, this is a sign of systemic problems in their business model. With Ocala Tree, you will be looked after by a group of professional and educated tree experts. All of our employees are trained and experience in the practice of ISA standards, providing you with the best tree care money can buy. Further, our accredited arborists are here to help you make the best decision when it comes to tree care, and especially tree removal considerations. Regardless of the reason you may be considering to have a tree removed, we will provide you the appropriate help to get rid of the tree successfully, quickly, and cost-effectively. With our complimentary tree removal quote, we will recommend the method of getting rid of the tree, in addition to all the other details, such as needed equipment, team size, and other details, such as how to dispose of the salvaged wood. We will provide you with a firm quote for the job along with our insurance and licensing information. With this information, you should be in an excellent position to make the best decision for your tree and landscape. What are the company's business and staff qualifications, relative to licensing industry-recognized credentials, and experience? What references do they possess, both online and from past customers you can speak with directly? Are they accredited by tree care associations, such as ISA and TCIA? Does their insurance information come from a 3rd party source - if it is provided directly to you (from them) it could be fraudulent? These suggestions in addition to the other criteria are critical for you to consider when making a tree removal decision. Tree removals, while not overly complicated, do come with a risk to life and property. If performed by a tree service company that is inexperienced and/or not insured, the risk is potentially significant to the property owner. Tree service Ocala trusts is our motto and philosophy. All of our equipment, employees, and business/tree care practices are in place to assure you of a safe tree removal process. 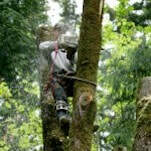 Do not take for granted that any tree service company can perform tree removals to your satisfaction and safety. Many will take shortcuts both in safety and comprehensiveness, leaving you with a potential risk and mess. Only consider and select a well-qualified tree care contractor who have all the tools and tree service practices in place. Tree removal pricing depends on a number of factors relative to the tree. While each tree is different, we can generally provide a broad price range for the tree removal cost you can expect. Size - we break trees down into three groups: under forty feet in height; between forty and eighty feet; and over eighty feet. Tree removal prices for the smallest group of trees will be approximately $400 - $800. For the medium group of trees, removal cost will be around $800 to $1,200. Pricing for trees over eighty feet will be over $1,200. The larger the tree the more labor there is involved with cutting it down and disposing of it. Further, some larger trees will require specialized equipment, such as a bucket truck or crane. Location - the cost to remove a tree near a building or power line will be slightly more than the above prices due to the precautions we need to take to safeguard these structures. Species - some trees are a bit more costly to remove due to how they grow. We do our best to keep our prices reasonable, but quality tree care does cost money. Removing a tree can be difficult and challenging, which requires skill, experience, and the proper equipment.